Fifteen years ago, NIS America released Atelier Iris: Eternal Mana. This was the first of the Atelier series released in the North American market. The Atelier series in its early days were good RPGs with gigantic amounts of crafting in them. 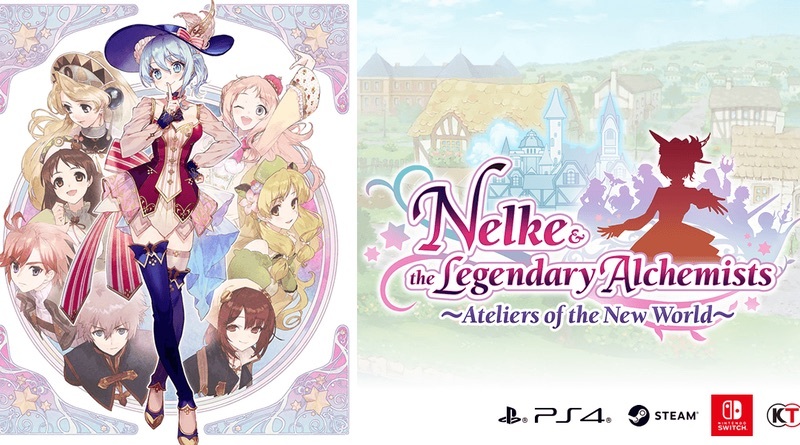 Nelke & the Legendary Alchemists: Ateliers of the New World is a spin off game of the Atelier series, so don’t let it fool you into thinking that there is a quality RPG hidden in here somewhere. As a fan of the early Atelier games, I’m always hopeful that they will return to their roots featuring the crafting mechanic with heavy doses of RPG and story elements in them. At the start of the game players will meet Nelke and her maid Misty as they enter the town of Westbald. Nelke is looking for something called the Granzweit Tree. It’s a powerful artifact left behind by the Sage of Granzweit. Nelke’s father oversees the region and has placed her in charge of the village. The only thing on her mind is to find the Tree, but her father has other things to keep her occupied. He gives her various tasks for the village, such as making sure the population reaches a certain level, or the town’s finances stay in the black for a certain number of turns. In this way, the game feels more like a simulator than your typical JRPG. Each turn consists of two different types of days: weekdays and holidays. Weekdays are days where Nelke needs to administer the town. This is where she can choose which buildings to build and what products to create and sell in the town. She can also assign people to the different shops and Ateliers. The resulting products created by the alchemists and sold in the stores will either turn a profit or lose money. When building the town, Nelke calls on the carpenter, Hagel, oversee the placement of the buildings and to create the groves and gardens. Each building has a particular use. Gardens and groves provide Alchemy materials when someone is assigned to look after them. Ateliers are used to create items to be sold in the stores. Roads need to be connected to the buildings for them to function, while cosmetic items, like planters and bushes, give bonuses to that section of town. For example, planters reduce the hiring cost of characters and fences reduce the construction cost of buildings. These things don’t have to make sense apparently. During the Holiday, Nelke can talk to the different townsfolk and increase her friendship among them as well as continue the search for the Tree. There is a time limit on this phase and so every time she’s talking to someone it takes time away from other tasks she could be accomplishing. Improving her friendship connections with the people will make them more productive in subsequent rounds. Eventually they will also start asking for your help and giving you more things to find and to during the search for the tree. Time management is definitely a skill needed to play this game, since the more time you spend with the people, the less time you have to find the tree. Researching during this phase is where Nelke works with the other alchemists she has met to create new items to sell in the store. The higher the level of friendship between them the better the items they can research and create. Investigating is where Nelke and her friends can search the surrounding areas for the Tree. This is where players pick an area to explore. Once chosen there are several paths in that area they can take, but first, the town must spend money to open the path. More money can be spent to improve the path, which will in turn bestow party bonuses, like increased strength while on the path. Investigate is the last thing she can do on the holiday so once this is selected and completed, success or not, the day is over and the next weekday starts. Investigate takes whatever time left over from researching or visiting with the townsfolk and it slowly counts down until it either reaches the end, or the group finishes the trail. Along the path the characters banter back and forth, as well as find special spots on the road that require different items to retrieve ingredients. The only interaction on the path is whether to walk or run. Otherwise the group is on autopilot and players cannot change anything except walk or run on the path once the path is selected. There is no exploration in the game and there is no deviating from the path once it is selected. Boring! Fights happen as random encounters. The group can walk or run while investigating. When walking the group will find more ingredients, however, it takes more time to get to the end. Running takes less time to get to the end, fewer ingredients are found and more fights are battled. The fights can be automated as well and players can simply select the option to watch the combat take place. Overall the battles are super simple and easy so it’s probably useful to just have it battle automatically as they’re mostly mundane affairs. If you choose to manually fight, the game uses an active time battle system. Much like earlier JRPGs, there is an active time battle gauge indicating how long until the next enemy or party member is going to attack. Once their character portrait reaches the end of the time line it is that character’s turn to go. Select which action they take and watch the outcome. Visually this title looks like it could have easily been released in the early days of the PlayStation 3. The animations are rather stiff, and simple things, such as walking around, is really annoying because the footsteps do not match the pace at which they are walking. In fact, it looks like the characters are gliding over the ground on which they walk. The character portraits pop and are full of color during cutscenes. Just like in most anime fashion, some of the female characters are dressed rather absurdly. Both Nelke and her maid Misty are in full dresses while investigating through the various areas whereas the male characters are competently dressed for the occasion. The music fits well with the game, but nothing really grabbed me. There seems to be a lot of flute and guitar tracks with some drums mixed in on most of the tunes. The town music is whimsical while the battle music does a nice job of not being too overwhelming during fights while remaining upbeat. One big issue is that the character banter during the investigation phase can get annoying. When walking down the path characters are speaking and speech bubbles are popping up too quickly. When a special even happens, like multiple people finding items on the path, the screen cuts to that and the characters lose all of the chatter completely. While it’s all flavor text, it would still be nice to be able to read a complete conversation between characters. Overall, Nelke & the Legendary Alchemists: Ateliers of the New World is not your normal Atelier game. It is very much a “manage your village game” with a little bit of RPG elements thrown in. The combat system comes up short and most of the gameplay is just downright boring. The town management section is mediocre at best and the game really doesn’t do a very good job of explaining how to properly build a successful village. If you are looking for a robust JRPG like the Atelier games of the past, this is not one for you. Nelke & the Legendary Alchemists isn’t really a traditional RPG and is more of a town simulator than anything. Atelier fans will be disappointed with the way this game turned out and unfortunately the presentation doesn’t do the game any favors. Boring gameplay means this is one you can easily pass up.